TCR on Film: An Interview with Edward Z. Epstein, author of "Audrey and Bill: A Romantic Biography of Audrey Hepburn and William Holden"
In Audrey and Bill: A Romantic Biography of Audrey Hepburn and William Holden, just published by Running Press, veteran film journalist Edward Z. Epstein creatively uses the personal relationship between Hepburn and Holden as a starting point for a wider look at how these two very big stars of the 1950s maneuvered through the changes that came to their lives and to the film industry in the 1960s and beyond. 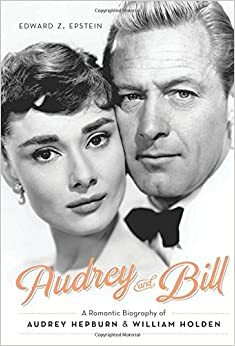 "Both stars are charismatic screen personalities, favorites of mine, and I’d thought for a long time about writing a book on the largely untold story of their romance," Epstein, who is the author of numerous books on film subjects including Paul Newman, Clara Bow, and Marlon Brando, told The Committee Room. "As New York press contact for MCA/Universal, I worked with many people, over the years, who knew both Audrey and Bill, and who were familiar with the problems they faced and the pressures of the business they were in." Today Hepburn is an icon recognizable even to those not so familiar with her film work. Holden, though he had a much longer career than Hepburn and his once tremendous box-office clout earned him the nickname "Golden Holden," has not been so well remembered.